Do you want to give your visitors the best possible experience when they visit your blog, read your content, signup to your free offers, or even buy your products and use your services? Well, in this post, you’ll discover 9 awesome ways to make your blog more user-friendly. Having great content is just one of the vital ingredients needed to make your blog stand out and become successful, do you agree? 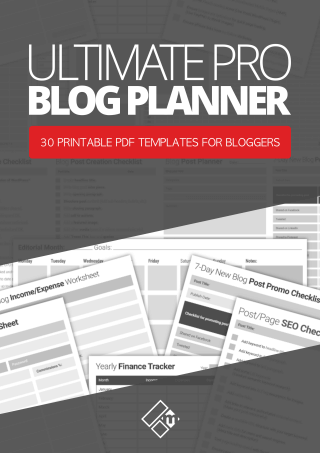 You might have 100, 200, 300 or maybe 1,000 pieces of high-quality content on your blog right now. But let me ask you something. What good is having all of that awesome content, if it’s not easily accessible? Now I know it’s not even remotely possible to have each and every piece of content on your blog visible from a single point of access. However, there are plenty of things you can do to make your content – 1, easily accessible, and 2 – a pleasurable experience to consume, simply by making your blog more user-friendly. So in this post, were going to look at every possible way to do just that. Let’s talk about design, and why having a clean, clutter-free blog design is critical and can help you make consistent progress with your blog. This post by Iron Paper, quotes that almost 60% of consumers worldwide would rather engage and interact with content that’s been beautifully designed rather than just simply designed. Let’s put this into perspective for you and your blog. What does this mean exactly? Well, It means that design is very important. You spend an enormous amount of time producing great quality content so it would make perfect sense to put that content on a great looking blog, right? A great blog design will not only make your content stand out, but also make your content a real pleasure to read, watch, listen to, by your audiences far and wide. You can either hire someone to create a custom blog design for you. 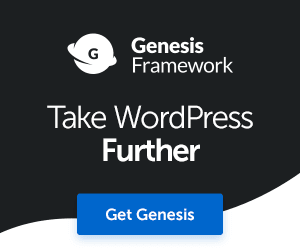 Or, you can invest in a high-quality premium WordPress theme like Genesis. OK, so now let’s take a look at how you can prioritize user experience on your blog to make your content truly stand out. The header and main navigation section of your blog should be top-priority because essentially this is the first thing your visitors will see when they land on any page or post on your blog. Keep your blog header and navigation clean and simple. Your logo and navigational links should be the only elements present in your blog’s header. If your conversion goal is to get people to read your blog, make sure that a link to your blog page is clearly visible on the menu. In fact, make this the first item on your menu. If you have a banner ad or any other elements in your header area, consider removing it.If you have links to your social profiles in your header, consider moving these to the footer section or sidebar. If you have links to your social profiles in your header, consider moving these to the footer section or sidebar of your blog. You can either create a custom homepage for your blog or display a list of your latest posts. I always recommend creating a custom static page for a blog, because it gives you way more control over what content/posts to have displayed, as well as control over things like your marketing message and SEO. CopyBlogger is a fine example of a blog that takes full advantage of using a custom static homepage. 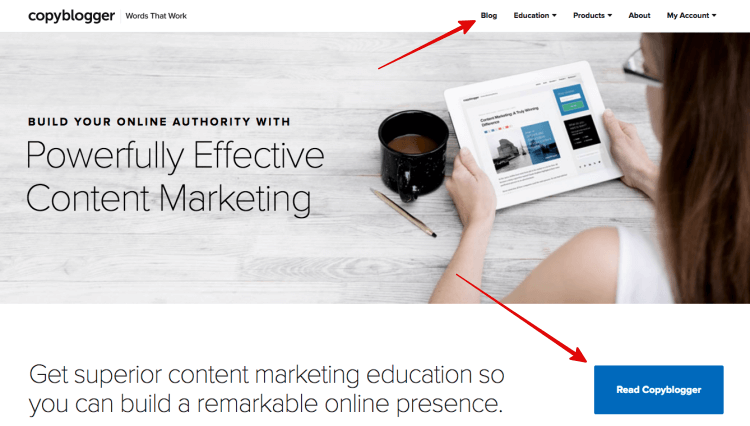 As you can see in the screenshot below, CopyBlogger makes their blog page link a top priority in the navigation section as well as their homepage call-to-action. Clearly, CopyBlogger want’s it’s visitors to consume its content before anything else. Create a custom static homepage. 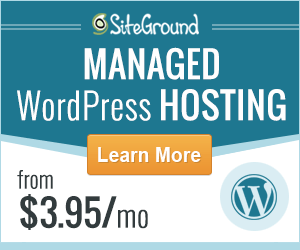 Add a powerful headline/message and a CTA button to your blog page. Showcase your best content on the homepage. 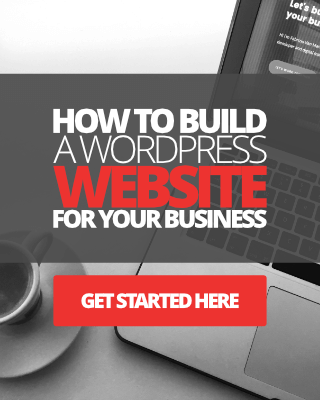 Check out this video post I created showing you how to build a custom homepage for your blog using an amazing tool called Thrive Content Builder. Also, check out this post on how to optimize your homepage for increased conversions. Let’s now talk about your blog’s sidebar and how this can be optimized for better user experience. 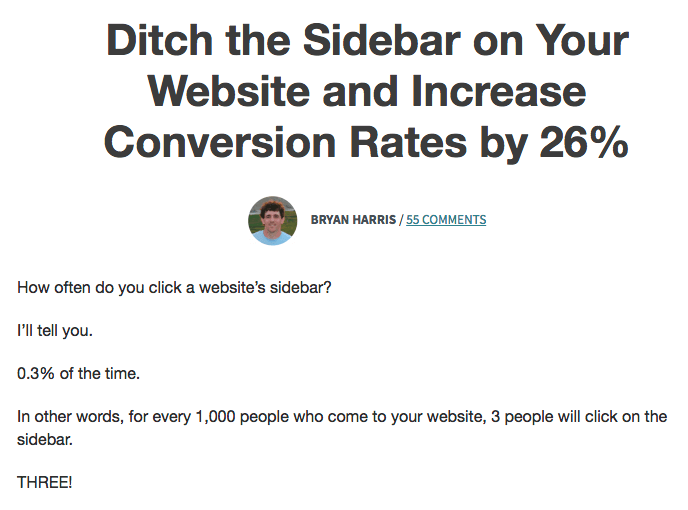 Some online brands claim that not using a sidebar on a blog can help improve conversions, by eliminating distractions. I have experimented with both options for a good length of time for Magnet4Blogging, and so far I haven’t seen any significant variations in conversions. According to this interesting case study on Video Fruit, for every 1k people who visit your website, potentially only 3 people will click on your sidebar! If you decide not to use a sidebar and want to make your content the main focus, then go for it by all means. If you decide you want to keep your sidebar and want to make better use of it, I recommend placing only the essential elements in there, as too many items in the sidebar can be a HUGE distraction for your blog readers. 1 x email opt-in form with incentive. A small section about the author, YOU. A list of your latest or best blog posts (I recommend your best blog posts is placed here). One banner to your awesome product or service. Anything else in your sidebar, in my opinion, is simply unnecessary noise. 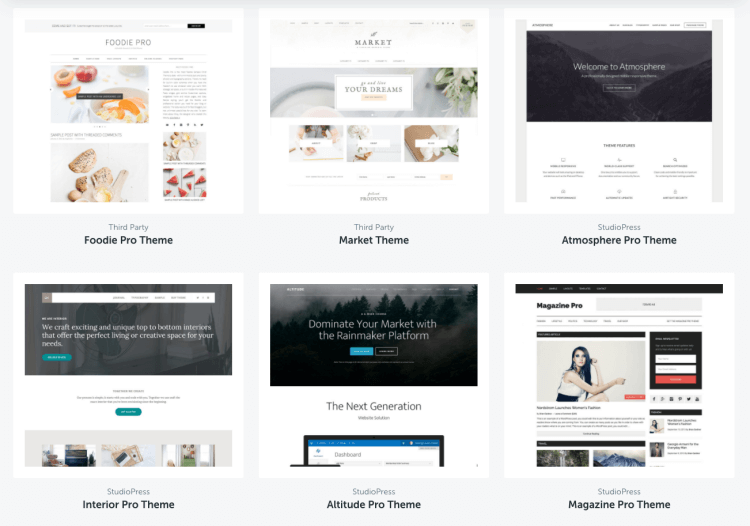 I designed the Magnet4Blogging theme without a sidebar because I wanted to make my content the focal point for my visitors. Your amazing content is of course what makes your blog truly awesome. To make it even more awesome, you should ensure that your content is accessible to a wide audience, in other words, easy to read and understand. In addition, you should also ensure your content is well formatted and well organized. Here’s a list of things you can do to make your content super user-friendly. Keep paragraphs short and sweet. Avoid huge blocks of texts. Break up text with relevant images, videos, screen captures, graphs and graphics. Make use of bullet points and quote boxes, but keep these to a minimum if you can. Don’t use too many over-complicated words or phrases. Link to other relevant articles on your blog or to relevant external sources. Another way to improve your content is to make sure it actually makes sense. And, that there aren’t any spelling or grammatical errors. Use a tool like Grammarly to help you with this. Next, we get to the footer section. Now a lot of bloggers believe that the footer section of a blog is just a waste of space or time. Nothing really needs to be placed in the footer apart from some mandatory links to privacy pages and what not. Personally, I think the footer area is a great place to add an additional call-to-action, such as an email opt-in offer. If someone has made it to the bottom of one of your blog posts, and past the comment section, they’re pretty much down to the footer section too. So, don’t waste the opportunity of being able to capture them as a potential subscriber. Other than that, you don’t need to have too much other clutter in the footer area, just something that might benefit your audience. Every blog should have a search box somewhere. If you are using a sidebar, the best place to put your search bar is at the bottom of your sidebar. To make the search feature even more useful for your readers, I recommend you install a plugin called Search Exclude. See image below. This lightweight plugin is simply amazing. 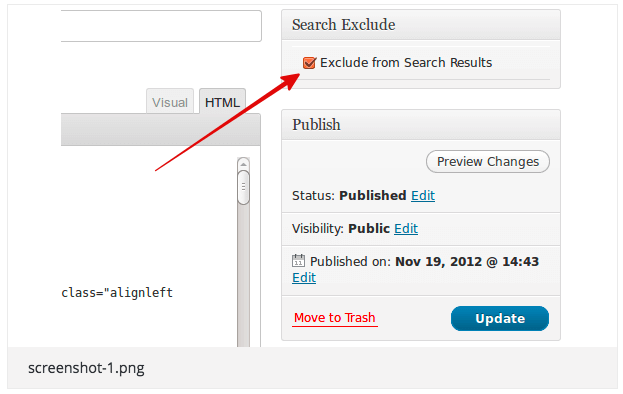 You can use it to exclude any post or page from your WordPress search results. Why would you want to do this? you might ask. Well, to make sure that only your very best content is being presented in the search results when someone is searching for something specific on your blog. Probably the best way to make your blog more user-friendly is by improving its performance on the web. If your blog is not mobile-friendly then you are certainly still stuck in the dark ages I’m afraid to say. Every single blog, or website, today is more or less optimized for viewing on mobile devices such as tablets and smartphones. 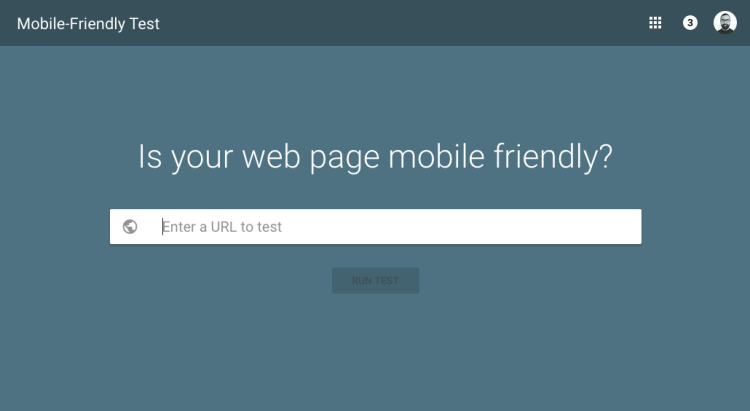 Use this tool to make sure your blog is mobile-ready. If it isn’t then you need to do something about it quickly. Click here to see how I can help you with this. So let’s quickly recap what we’ve covered. Clean up your header and navigational links. Declutter or remove the sidebar completely. Make better use of the footer section. Improve your blog’s search feature. So there you have it, 9 no-nonsense ways to make your blog super user-friendly, now go and make a start as soon as you can. Psst! Need help with your blog design? Click this link to get started with me. Very detailed guide you have here Fabrizio! Glad to have read another of your blog post. I always have so much to learn from you. By the way, in terms of home pages.. is there a plugin we can use to customize the layout and look? Those are some wonderful points to note down. User friendliness is the key to conversion and these points surely do help with making users feel warm and comfortable. Great to see you here. Glad you both enjoyed agreed strongly about the points in this post. It’s so easy to clutter a website up because we think it will benefit out audience and visitors, but it really does the opposite. I’ve lost count at the number of times I’ve visited a website, felt overwhelmed by the number of options given to me, and I left. Thanks again for checking out my post, Jane, take care.